AUD 11,111 Excl. Duties / Taxes. 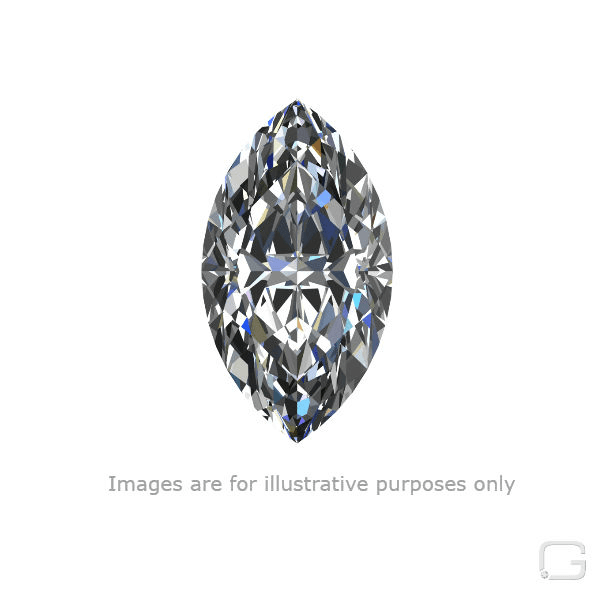 This Marquise diamond is 1.51 carat in weight, and comes with Good polish and Good symmetry, as verified from an independent gemological laboratory. The diamond is graded D in colour, and has a clarity grade of VS2. The diamond's GIA grading report number is 6197630808, which will detail further its specifications and measurements, and will also come with the purchase of the stone. This Marquise diamond is 0.59 carat in weight, and comes with Good polish and Good symmetry, as verified from an independent gemological laboratory. The diamond is graded E in colour, and has a clarity grade of SI2. The diamond's GIA grading report number is 5202161357, which will detail further its specifications and measurements, and will also come with the purchase of the stone. This Marquise diamond is 0.7 carat in weight, and comes with Excellent polish and Very Good symmetry, as verified from an independent gemological laboratory. The diamond is graded F in colour, and has a clarity grade of VVS1. The diamond's GIA grading report number is 6325415046, which will detail further its specifications and measurements, and will also come with the purchase of the stone. AUD 3,397 Excl. Duties / Taxes. This Marquise diamond is 0.83 carat in weight, and comes with Very Good polish and Good symmetry, as verified from an independent gemological laboratory. The diamond is graded D in colour, and has a clarity grade of VS2. The diamond's GIA grading report number is 6197830664, which will detail further its specifications and measurements, and will also come with the purchase of the stone. AUD 10,588 Excl. Duties / Taxes. This Marquise diamond is 1.52 carat in weight, and comes with Excellent polish and Very Good symmetry, as verified from an independent gemological laboratory. The diamond is graded F in colour, and has a clarity grade of SI2. The diamond's GIA grading report number is 3175807051, which will detail further its specifications and measurements, and will also come with the purchase of the stone. This Marquise diamond is 0.45 carat in weight, and comes with Very Good polish and Very Good symmetry, as verified from an independent gemological laboratory. The diamond is graded D in colour, and has a clarity grade of SI1. The diamond's GIA grading report number is 7293867027, which will detail further its specifications and measurements, and will also come with the purchase of the stone. This Marquise diamond is 0.3 carat in weight, and comes with Very Good polish and Very Good symmetry, as verified from an independent gemological laboratory. The diamond is graded E in colour, and has a clarity grade of VS2. The diamond's GIA grading report number is 6311348823, which will detail further its specifications and measurements, and will also come with the purchase of the stone. AUD 7,367 Excl. Duties / Taxes. This Marquise diamond is 1 carat in weight, and comes with Very Good polish and Good symmetry, as verified from an independent gemological laboratory. The diamond is graded E in colour, and has a clarity grade of VS2. The diamond's GIA grading report number is 5182685431, which will detail further its specifications and measurements, and will also come with the purchase of the stone. This Marquise diamond is 0.3 carat in weight, and comes with Very Good polish and Very Good symmetry, as verified from an independent gemological laboratory. The diamond is graded D in colour, and has a clarity grade of VS2. The diamond's GIA grading report number is 3295804911, which will detail further its specifications and measurements, and will also come with the purchase of the stone.